Samsung has set its focus on expanding the mid-tier offerings for consumers in the US. It has unveiled two mid-range Android devices including the Galaxy A6 (2018), and the Galaxy Tab A 10.5. While the single-slot SIM Galaxy A6 is priced at $359.99, the Galaxy Tab A 10.5 (Wi-Fi) on the other hand starts at $330. The 5.6-inch super AMOLED “Infinity Display” Samsung Galaxy A6 is equipped with .6GHz Exynos 7884 chip, 3GB of RAM, 32GB of expandable storage while the device runs on Android 8.0 Oreo. Galaxy A6 packs 3,000mAh battery that could last all day. Coming to optics, there is a 16-megapixel rear shooter with a bright f/1.7 aperture, while the 16MP front cam’s f/1.9 aperture promises solid selfies. 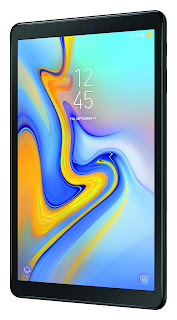 Galaxy Tab A 10.5 seems to be the midrange counterpart to the Galaxy Tab S 10.5 tablet, as it arrives with 10.5-inch 1200x1920px IPS LCD screen, which is powered by Snapdragon 450 chipset with 3GB of RAM. Under the hood is a massive 7.300mAh battery. With 2 cameras onboard such as an 8MP f/1.9 main and 5MP f/2.2 selfie snapper, the Galaxy Tab A 10.5 runs on Android 8.1 Oreo OS and costs $329.99. “Consumers are increasingly looking for innovative features and high-quality hardware in mid-tier mobile devices. Samsung is delivering by expanding its line-up with excellent devices offered at an exceptional value,” Samsung added.